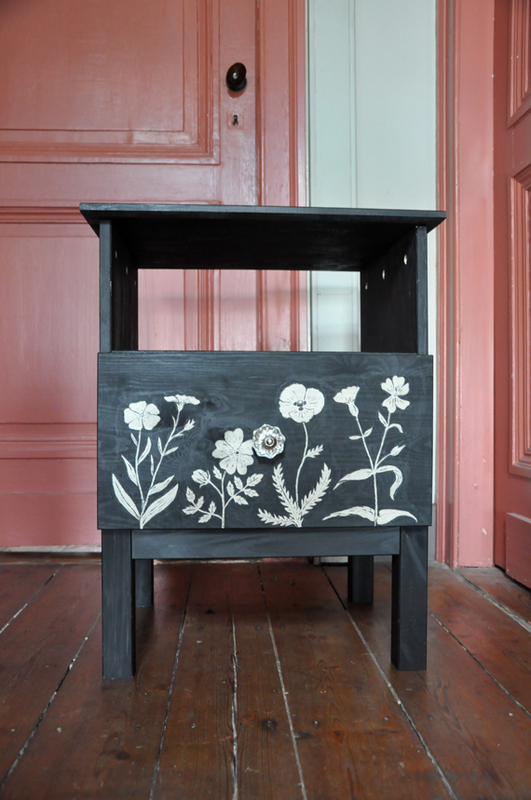 I have a history of covering cheap wooden furniture in paint to make it look a bit nicer (hopefully) and did it again! 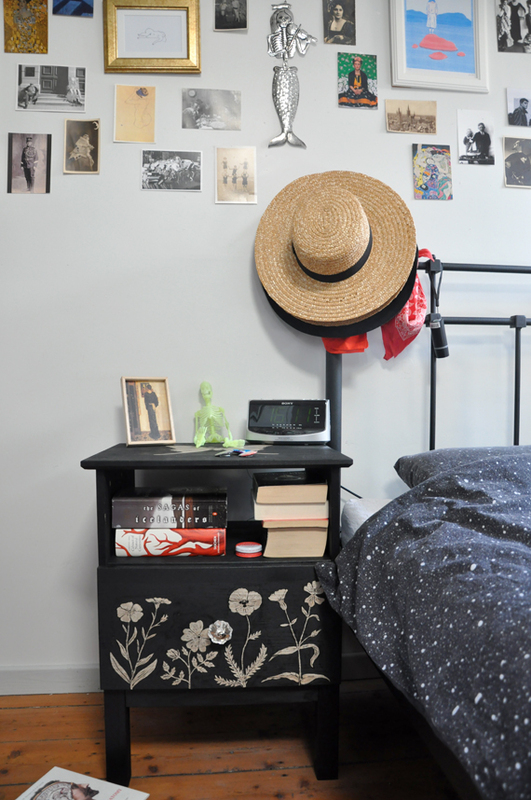 For the longest time, I used an ancient side table as a nightstand (and when I say ancient I mean I took it with me when I moved out of my parents' house, where it had been for as long as I remember). It was all right, but I realised I could use a bit more storage space for some of the stuff that is just floating around in our bedroom and bathroom. Who knew the solution to a messy place would be storage! 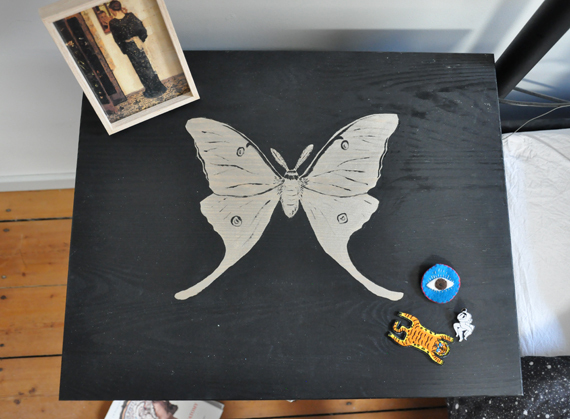 So yeah, I got a super basic nightstand made from untreated wood and some acrylic paint, and then spent a few afternoons painting flowers and moths! Most of these ware vaguely based on old biological illustrations. I didn't really have a plan apart from 'cover the sides in flowers' so just sketched them on in pencil. 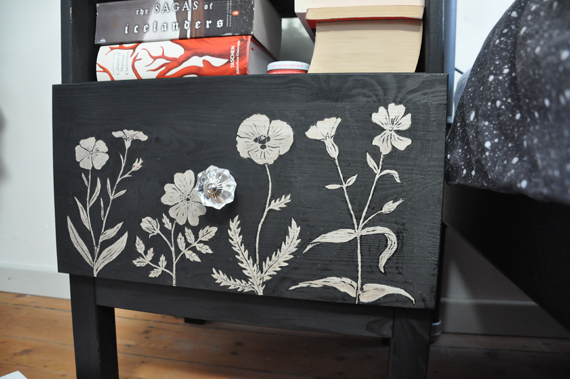 I used silver paint to roughly cover the areas where the flowers would go and then did the clear outline and details in black. Tiny brushes were used! I also added a diferent knob than the one that came with the nightstand, because fancy glass is nices than basic wood. After painting this over a few days I put it together one night when I couldn't sleep (haha) and bam! New nightstand. 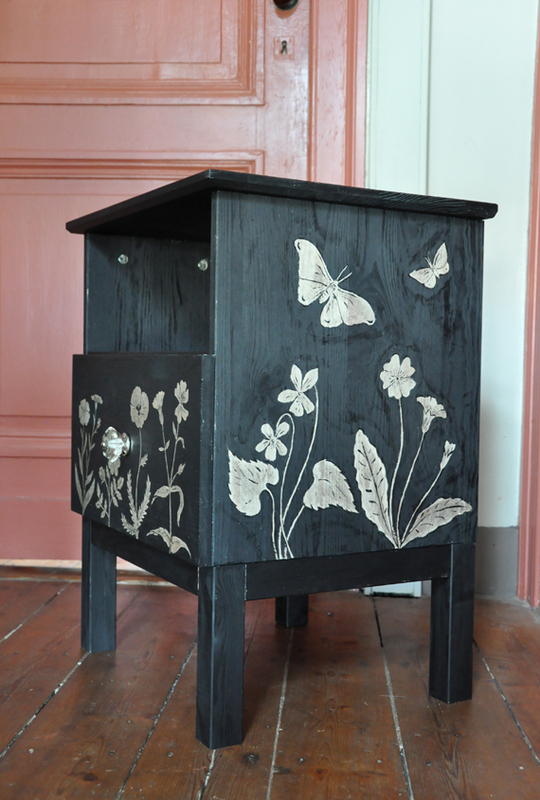 I painted a large moth on the top since more flowers might have been a bit much. (Of course, some people would say that covering furniture in drawings is a bit much in itself...). I arranged some pins and a little frame for the picture, normally this would be covered in books, bits of paper, hair ties and pencils. So this is what it looks like in my bedroom! Also in the picture, if you look closely: the flashlight I can always reach if I wake up in a panic from a nightmare. Not pictured: a mountain of laundry. I have a few more drawing projects to talk about, but since one of them involves scanning 26 pages so that might take a while!